Duquesne University is home to a three-choir program, led by Director of Choral Activities, Dr. Caron Daley. The choirs regularly present concerts and outreach performances around Pittsburgh and the region, including 2017–18 appearances at Trinity Cathedral, St. Bernard Church, Pittsburgh Creative and Performing Arts School, North Hills High School, Little Sisters of the Poor, Westminster Presbyterian Church (Buffalo), and St. Peter Cathedral (Erie). In 2016–17, the Duquesne choirs performed at the Duquesne University Presidential Inauguration, Carnegie Music Hall, Shadyside Presbyterian Church, East Liberty Presbyterian Church, the Grand Halle (Johnstown), and the Cathedral Basilica of Saints Peter and Paul (Philadelphia). The University's touring choir, the Voices of Spirit, travels annually and was invited in March 2018 to act as the guest choir for the American Choral Directors Association Eastern Division Conference Conducting Master Classes. Duquesne's newest choir, the University Singers, is an all-campus ensemble, open to students in all academic majors, faculty, staff, and alumni. Voices of Spirit is a mixed chamber/touring choir dedicated to the study and performance of choral music at an exceptional collegiate level. 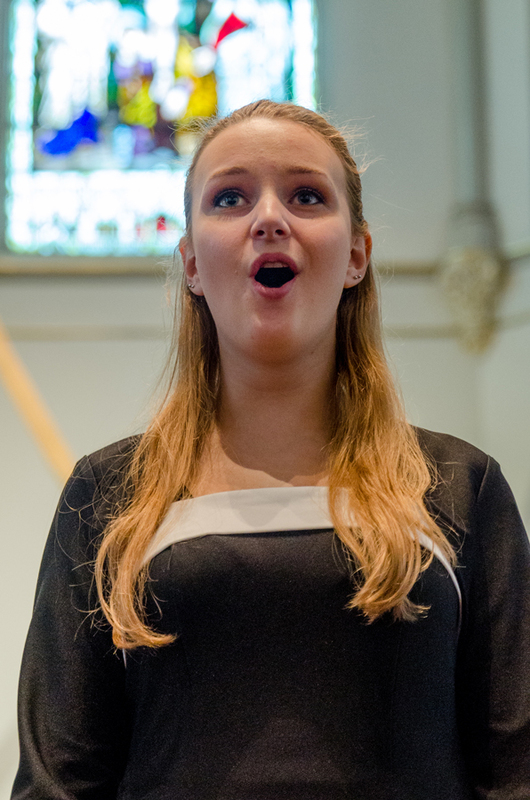 Each semester, the choir performs several on- and off-campus concerts, including solo concerts and/or touring, large-scale performances with the Pappert Chorales and University Singers, and collaborations with Duquesne University instrumental ensembles. Voices of Spirit is open to students in all academic majors with excellent reading skills who want a challenging choral experience. Admission is by competitive audition. Sign-up for a choral audition starting August 20, 2018 on the choral bulletin board outside Room 206A of the Mary Pappert School of Music. 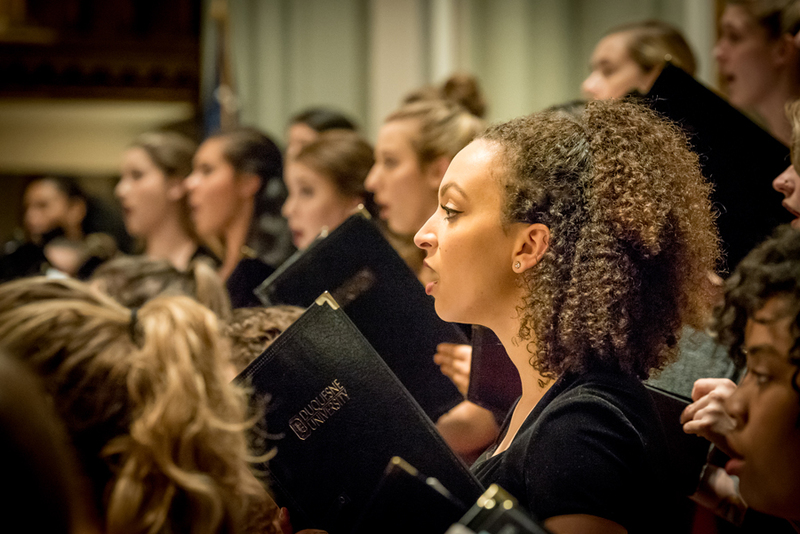 The Pappert Women's Chorale is symphonic women's choir dedicated to the study and performance of choral music at a challenging collegiate level. Each year, the Pappert Women's Chorale performs in several large-scale performances (including collaborations with the Voices of Spirit and University Singers), Mary Pappert School of Music events, high school visits, and regional choral festivals. Prepare a simple song (hymn, carol, art song, musical theatre song, folk song, opera aria, or the national anthem) to sing a cappella. Choose a song that suits your voice and showcases your range. Duquesne's newest choral ensemble, the University Singers, is an all-campus mixed choir open to music majors, non-music majors, DU alumni, DU faculty and staff, and area community members. Performances: 1–2 on- and off-campus performances per semester, including Christmas at Duquesne and other collaborations with the Voices of Spirit and Pappert Women's Chorale. Prepare a simple song to sing a cappella (hymn, carol, folk song, art song, musical theatre song, opera aria, or the national anthem). Choose a song that suits your voice and showcases your range. Additional audition details for each choir can be found it its respective tab below.